Walking Away from the Moon? On Saturday 29th August at 19.35 BST, there’s a full moon in Pisces, conjunct Neptune, and of course the opposing sun in Virgo. There’s lots to say about it, but I’m not going to. With apologies to people who’ve enjoyed the new and full moon reports, I’ve decided to stop doing them. At the moment it’s difficult for me to say exactly why I feel the need to do this, but for some time I’ve been feeling uncomfortable about the influence of the moon. I have the sense that it’s time for us to be a bit more careful about the energy we give to the moon, and how much we let ourselves be guided by her. This has reached the point where I no longer want to do lunar forecasts in conventional astrological terms. It makes me feel sad to say this, because I’ve loved the beauty of the moon, loved being outdoors in moonlight, and been so grateful to her for her work in regulating the tides, and all she apparently does to make our Earth possible for us to live on. When I lived on the coast, I often felt awed by the sight of a perfect full moon rising over the sea, laying its golden path straight to my window. What’s more, there’s the traditional identification of the moon with women, so that adds to my feeling of disloyalty in doubting her. Of course, I realise that the lunar forecasts I’ve been doing are accurate, and some people have found them very helpful, but there’s a deeper issue involved. This is to do with the extent to which we are collectively manipulated through our emotions, by all sorts of interests which don’t have our interests at heart. And of course, that process works through exploiting the power of the moon in our emotional, mental and sexual lives. If this sounds a little too cryptic, I’m sorry and I’ll say more once I’m clear about what exactly I should be saying. But what’s very clear to me, is that I want to offer readers only what I believe is truly helpful, and if I’m not comfortable with something for myself, I’m not going to give it to anyone else. 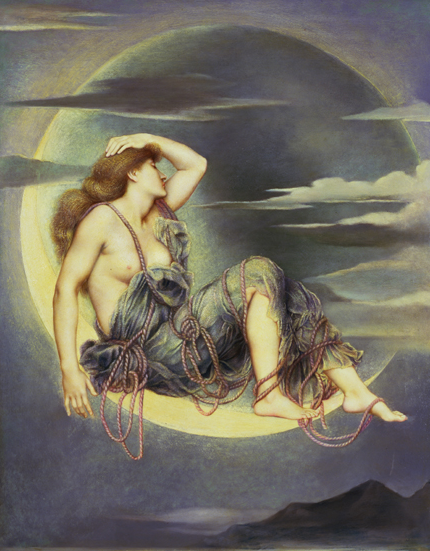 In the meantime I offer you this painting of ‘Luna’ by the Victorian painter Evelyn de Morgan. Look at how this moon is entangled in these ropes. Are they the bonds within which she struggles? Or the bonds with which she controls others? Or both? What do you think? The August 2015 New Moon: Relax!